Club Penguin Cheats by Mimo777 Club Penguin Cheats by Mimo777: Club Penguin Halloween Party is Here! I hope it's tomorrow because my penguin is banned today. The party is amazing! Rock on cp! this party is by far the best ever!!! Don't worry it will be tomorrow too! These activities go on for a week or so. Be careful on Club Penguin you don't wanna get banned again and miss a 1 day party! This is my fav party throughout the whole year! Rock on CP! awesome!!!! is the huanted houlse for members only? Ur always ready and always posting things, keep it up!! weird mimo there is a yellow puffle in the jack o lantern backround! thats horrible. why did they bring the bunny slippers back. Yea its good the halloween party is on but there is again, a cool new item only for members...not to mention the clothing. I really likd the pumpkin head. ***NOTE*** I am not trying to be a mod, just agreeing with someone. Haha... I haven't been on the computer at all today! I just checked your post Mimo, it's a nice one- as always. Now we all know why CP didn't let us on the home page... they were doing it all up for the Halloween party! Duh! This is absolutely awesome! Best Halloween party yet and I'm loving the Monster Maker! I am so annoyed that they brought back the night of the living sled. and that the fact they took away the frankenstein music away from the lab and they didn't even put it on new igloo music. I want disney out of club penguin! Goodness you are so critical today! I think Disney is doing a pretty good job. Also how could you be annoyed with night of the living sled 3!? Its the best! I can't wait until next year to see the forth one. Anyway cheer up and have a happy halloween! where is garys lab? this is the first time ive been on in weeks! Hey we got the home page back! CP's homepage is back! Now you start off at cp's homepage! Yes. It is for members only. Really? I'm going to chck that in a min! I'm sure everyone will have fun at the party! I found all the items! I bought some bunny slippers on accident, and I already have the same kind, and now I have a spare! That's BEAST! hey mimo if you click the lantern in the mine there is a secret room! Hey has anyone played Halo ODST? It looks so sweet and can't wait to play it! Mimo you should get it! mimo,you have to get the basket,dont you??? Mimo there are northern lights you can see from ice burg. Just want to let you know it's really cool to look at. Ya I took a look and your right! on th jack o lantern background there is a yellow puffle in the picture! soooooo not fair!!!!! non- members cant go into the huanted house!!!! that is soooo stuiped! i am going to complain to the cp team! Great find! That is pretty funny! I went on the French and Spanish servers and they don't have the same subtitle so it can't be either of them. Anyway good find and if you find what language it is please tell me. Sorry to burst your bubble but its not Spanish because I went on a Spanish server and looked for the subtitle and it wasn't there. Anyway please tell me if you find the language. Yes it is only for members. at the iceberg u can see the northern lights!! Hey Mimo. I went on Club Penguin and I went into the haunted house and there's a cheat. I don't know if you know it but if you click on any of the puffle statues,they change into a different puffle emotion! You rock Mimo! hey... thanks for the help!! penguins were asking is gary came to the lab?? is he here?? will there be a tracker?? EVERYTHING IS FOR MEMBERS ONLY! All nonmembers join me for a peace march throughout cp starting @ the lighthouse top tower on tuesday night at 7:30 pst. If you can't do that, do it on Saturday at 6:30 pst. Who s with me! 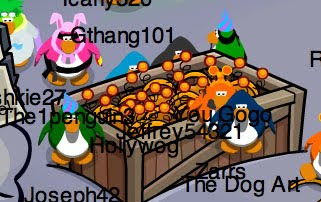 cool!, i coluldnt get on yesterday as so many penguins must have been trick or treating!!! You can also meet gary!! Please give me credit! Unfortunatly (for the non-members) yes, even though I don't think its correct! the prize is so Lame-O! Yeah, they used to be kinda cooler, but the last 2 years have been kinda lame-o. Ah well. How did you get in the haunted house if u are'nt a member? Yes, only the members can enter the Haunted House. Don't worry, this party will be on all week! But be carful, because you don't want to be banned on a one day only party! hey mimo can we find gary in this year halloween ? Hey mimo, i have got a picture of my friends list and one of my friends is called undefined,! and thats not its penguins namke! Im not sure how to send you the pciture so i thought i'd just tell you! Well spotted, but that screen is also in the lighthouse. It is just under the beginning of the stairs, beside the fod thing. Otie, clubpenguin has to make special member things. If they don't knowone would want to become a member! No, you don't need it. That was the prize for last year. Sorry if you couldn't get it! Last years party decorations were better, and i like the trick or treat pumpkin. But there are more member items this year. stinks for nonmembers. You're right Ethanator, the language isn't French or Spanish, It's Portoguese! Hey mimo whats up with the firey thing behind the iceberg? wow that is so cool, thanks mimo!p.s is it possible to walk on walls without cp trainer etc? wow thats so cool, my club penguin acount is p92271107 thanks for the cp cheats mimo. its in the mine and you have to click the lamp and the door in the wall opens. hope this helps! That 'Firey Thing' is and imitation of the Northern Lights. Its mean to be a thing made by the spirits of the dead, which makes it extra spooky! Actually, thats not true! Please make sure you're sure of what you're saying! That glow is and imitation of the 'Northern Lights' It's a thing people aren't sure of what it is, but its supposed to be something made by the spirits of the dead (If you believe that kind of thing)Which makes it very spooky! Don't put (CPG mod) after your name unless you are answering some ones question, or correcting their mistake. Don't worry, It'll probably be here soon! Probably. I bet he'd like to go and see how all his 'scientists' are doing in the lab. Also, he said that he would be discussing the matter of the dark clouds with the scientists! The party is soooo awesome! If you go into the mine, then click on the lamp hanging off the chain, The wall will crack in half and you can enter. You can only go in if you are a member. Ya its cool but theres just one thing missing A NEW MISSION!!!!! If they dont give us one after this I wanna protest!!!! Watcha think mimo?? Oh, I searched about Halloween Party everywhere but couldnt find it before MiMo.. Well, then, CPG was SO EARLY posting Halloween Cheats! :)) Thanks for your info Z! Go to the Mine underground, and there is a lantern hanging from the ceiling. Click the lantern and it will pull down, like a lever, and part of the wall will open! Go through there and your in the Lab! Nah, thats the Northern or Southern Lights! I sat in the same place I did last year at the dojo, when ninjas first arrived in club penguin. It was an awesome experience. I'm annoyed, non member's get nothing!... Well hardly. Also, once again the reward is rubbish and soon will be avalible to buy in the gift shop... great! yeh the party is the besst by far. There is a little movie going on about a sled. Is there a part 4 to it? Just wondering. Cause i want to see the end. that's horrible. why did they bring the bunny slippers back. its easy, new penguins make an account every day, penguins become members every day too. because of that, not everyone has the bunny slippers, a lot of people want them. you understand? i hope you do. actually this party i finnaly got them. awesome!!!! is the huanted house for members only? yeah, I'm sorry, but as mimo said, Disney got 3.5 million dollars from cp membership. Disney is now trying to get more money from membership by making non-members intimidated. yeah, sorry mimo for the extra work. Wow it looks just like Tootsvilles haunted house, Tootsville was first!!! Thats too funny. Tootsvilles Halloween party is gonna rock they are giving away a computer! Samantha they are spanish. I saw that too i dont know if it was on purpose or not! It is portuguese im sure this time. I checked. I think they did this in purpose to see if we noticed. Where`s Gary`s lab? I haven`t been on in weeks! If you go to the mine, just click on the lantern and a big crack will open up in the wall. It`s members only, though. Hope this helps! Yes, their will be a 4th. Next year though. CLubpenguin adds a new 1 every year! I thought the haunted house would be a quest like the knights adventure thing... its still fun though! Congrats! Mimo just posted your 1st comment! Mimo! at night of the livin' sled 2 when it says, "No, didn't you!?" on the li'l tv it says it in spanish! First, go to the mine. Next, click the lamp. The science lab door will appear in the wall! No, they are not fireworks. They are the Northren lights. Actually it isn't spanish it is Portugese. I checked. Its part of their compulsive drive but it won't affect me! Mwooahaha! Christmas is only 58 days away. They will most likely make another movie next year. I am not sure when the next mission will be but there are some rumors going around that Herbert is resposible for the volcano or has something to do with it. At the bottom of the background, there's a squished yellow puffle!!! to gustavo im pretty sure gary will be in this year why wouldnt he? where is garys lab its not in the book room any mor!!!!!! Go to the mine and click the lanterm then go into the room! Cool... I guess. There have been better parties but this is... decent compared to they're usual standards. But still cool. Have you noticed in the bottom right-hand corner of the Jack O Lantern backround, there is a squished yellow puffle? Cool But you only say Cpg mod after you anser a question XD remember that next time! Sorry dude but yes it is for members only! nope! unless if you already have a basket. wat is 5 to the 4th power? gp to the mine youll see a lantern that is hanging click on it and there you have it..... oh wait its for members only! its not really a waist of money yes i know its a little bit expensive but non-members are just not like members like think about everyone here know s that you want a membership yes thats fine but dont bash disney becuase you dont like members im am member for 4 years and i love it i can go into all the servers i can go to places that non-members cant.... all i am saying is dont push disney off the egde becuase your probs having a bad day... its just a game!! 'go there!' click that and you can see it! Hey mimo, r u a member on cp? I f u r then can u meet me at the coffee shop on the 16th of october? Also r u on habbo? zxz192 Yeah the haunted house is only for members.IT's not really fair though. (CPG mod). Thank you for that help if you go on to rainbow and in the plaza you will see somone whom is me dressed like you! I dressed exacy like you cool huh! 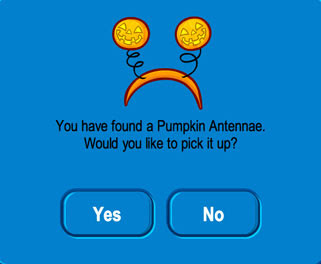 Why is there a yellow puffle in the lower-right corner of the pumpkin backround? Mimo I can't get the cube in the soccer field because it's all white. Please help. I think that they wanted to do something different from last year's party regarding the music. As for the Night of the Living Sled, the Monster Maker in the Lab is sort of based around of it, so it would be kind of confusing without the movie.